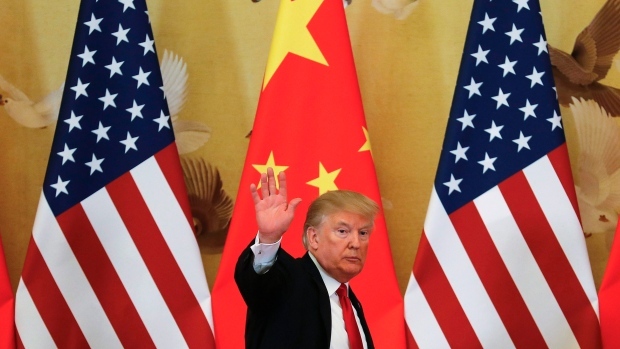 President Donald Trump wants to move ahead with a plan to impose tariffs on US$200 billion in Chinese imports as soon as a public-comment period concludes next week, according to six people familiar with the matter. Stocks fell on the news, with the S&P 500 testing the key 2,900 level. The offshore yuan dropped to the day’s low, while the dollar and the yen gained amid a flight to safety. The tariff news exacerbated already fragile market sentiment amid currency routs in Argentina and Turkey. Some of the people cautioned that Trump hasn’t made his final decision, and it’s possible the administration may enact the duties in installments. The U.S. has so far imposed levies on US$50 billion in Chinese goods, with Beijing retaliating in kind. It’s also possible the president could announce the tariffs next week, but say they will take effect at a later date. The Trump administration waited about three weeks after announcing in mid-June that it was imposing tariffs on US$34 billion of Chinese goods before they were implemented. The next stage of tariffs on US$16 billion of goods took hold in August. The imposition of the US$200 billion tranche would be the biggest so far and would mark a major escalation in the trade war between the world’s two largest economies. It is likely to further unnerve financial markets that have been concerned about the growing tensions.China has threatened to retaliate by slapping duties on US$60 billion of U.S. goods. The Trump administration is finalizing the list of Chinese targets and tariff rate, which could range from 10 per cent to 25 per cent, following six days of public hearings earlier this month. Trump’s plan to bring down his biggest hit yet on China comes as two-way trade talks show little signs of progress. Discussions between U.S. and Chinese officials last week in Washington yielded few results, thwarting hopes for a quick deal. The move comes as China hawks have been on the ascendancy in the Trump administration. One of them -- U.S. Trade Representative Robert Lighthizer -- has been responsible for one of the president’s biggest trade victories so far by forging a bilateral trade deal to replace NAFTA with Mexico. The deal was announced on Monday and Canada is now negotiating to join.